Back when I was a brand new watch lover I came across something weird called the Freak. I was still too much of a novice to know who or what Ulysse Nardin was, but the strange timepiece stuck in my mind – probably because there was nothing else like it (and still isn’t for that matter). Over the years the Freak kept coming back and eventually all the bits and pieces of what it was in full came together for me. I understood this freakish creation and all the innovations contained within it. My time spent trying to appreciate the Freak paid off, and it coincided with my overall horological education. Right now the Freak is about 10 years old – and still selling strong. I recently had an ironic conversation with the CEO and COO of Ulysse Nardin. They explained to me the importance of building useful complications that people would use on a regular basis. That they weren’t into making wildly designed watches that had a very niche appeal. To that I responded, “well what about the Freak?” Correcting themselves, “Beside the Freak we mean. That is why we called it the Freak, because it is wild and different.” It most certainly is. The Freak has recently been followed up with the Freak Diavolo. Not exactly a replacement, the Freak Diavolo improved upon the original design in a few ways, and also added a tourbillon complication. The “Diavolo” part of the name came from two horn looking windows in the back of the watch next to another window of the mainspring that act like a power reserve indicator. 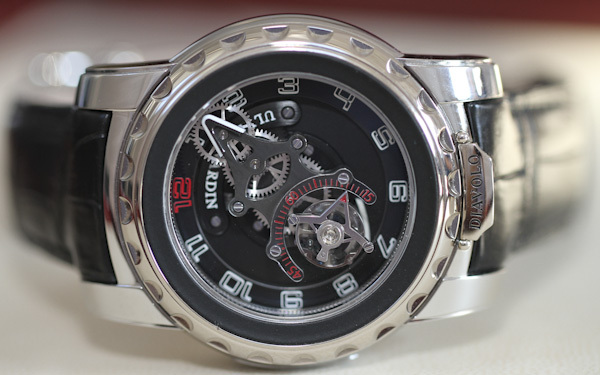 I first talked about the Ulysse Nardin Freak Diavolo watch when debuting it to the world here. The concept of the Freak requires a bit of education to understand, but in essence it is a simple and straight forward machine. 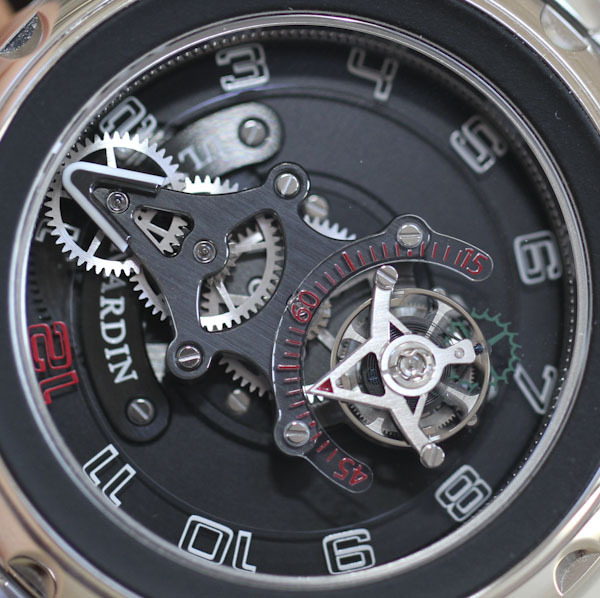 If the design wasn’t so unorthodox it would be a great watch to explain how a mechanical movement works. The original Freak movement was the minute hand of the watch (yes), and it revolved around the dial on a track each 60 minutes. This large hand contains the basic gear assembly required to make a watch operate. At the opposite end of the hand was the escapement. Looking closely you can see each of the gears moving together in a beautiful expression of how a mechanical watch movement operates. Under the large minute hand/gear assembly is an hour hand. The original Freak offered the hours and minutes only. For comparison purposes I have added some images in this article of the Ulysse Nardin Freak Blue Phantom so you can see how it compares to the Freak Diavolo. 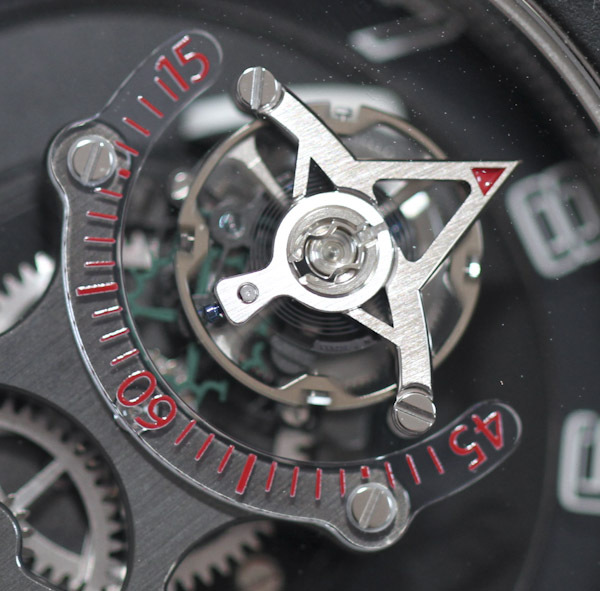 According to Ulysse Nardin the construction of the 44.5mm wide Freak case has many more pieces than the movement. The movement is around 50 part reportedly. An impressive feat as mechanically speaking, the less moving parts you have the better. The Freak movement was one of the first to make use of a silicium hairspring and escapement wheel (gear). Today Ulysse Nardin owns the company that makes these parts and will soon release a new in-house caliber (known as the Calibre 118) destined to be in more mainstream watches. It will also use a diamond-coated silicium hairspring and escapement for much improved reliability and accuracy in the movement. In the Freak Diavolo the silicium (silicon) escapement for example can easily be viewed moving around with the tourbillon in is marvelous blue color. Many people attribute Ulysse Nardin as not only being the original innovator of using silicium components in mechanical watches, but also heralding in a new era of the material’s use which has been adopted by many other very high-end brands. One of the quirkier elements of the Freak collection is that the case has no crown. Ulysse Nardin wanted to weird up the watch as much as possible, so all operations of the watch are controlled by rotating the bezel or caseback. 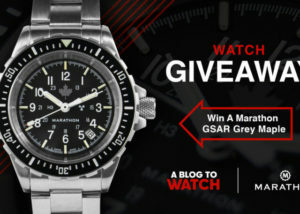 To wind the watch you must take the watch off and rotate the caseback counterclockwise. Through the caseback is a window to the large mainspring. You can see whether or not it is tightly wound, which acts as a power reserve indicator. Because it needs to be water resistant, the caseback is a bit stiff to turn, but the fully wound watch does have a power reserve of about 8 days. It is a logical system for winding a movement when there is no crown to operate. Moving the bezel will adjust the time in both direction. It is normally locked, so you’ll need to lift up a small lever located at 6 o’clock. On this model the term “Diavolo” is printed on the lever flap. As you can see the Diavolo makes due just fine without a crown, and the perfectly symmetrical look on your wrist is worth the quirkiness. One of the most important improvements in the Diavolo over the first Freak is the lack of pinion sticking through the sapphire crystal. 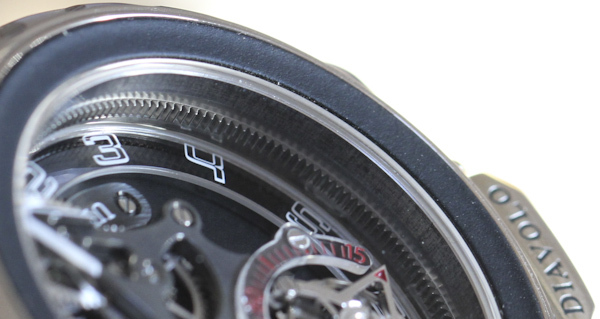 Originally, in order to secure the large hands, the Freak had a metal rod that went through the center of the watch. It actually stuck out a bit (though was polished and smooth) through the crystal. It isn’t too noticeable, but Ulysse Nardin wanted to engineer it out for the next model. The Freak Diavolo does not contain this pin and is able to secure the movement in other ways. 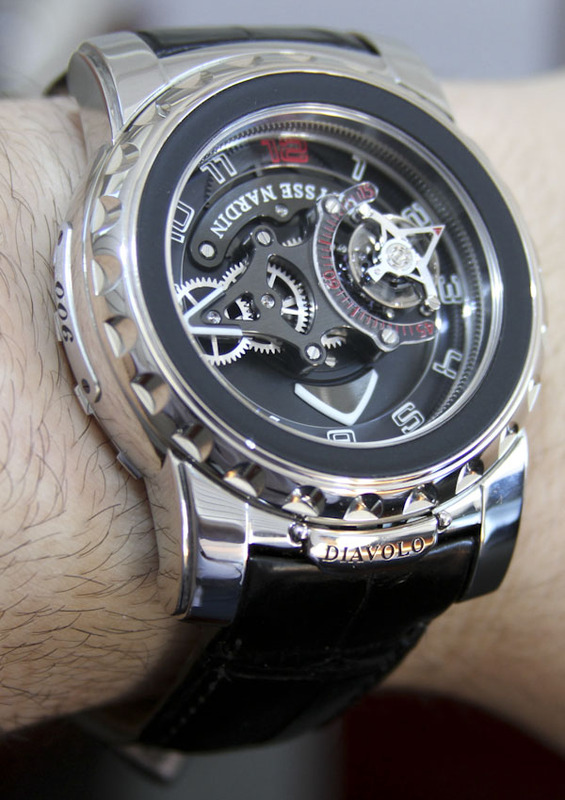 The most noticeable new feature of the Diavolo is the tourbillon. Where the escapement was located in the original model sits a beautiful and complex tourbillon style escapement. It also doubles as a seconds indicator – a function lacking in the original model. How hard is it to read the Diavolo? Not too bad actually. Sometimes the hour hand gets hidden under the large seconds hand, but it is a small sacrifice for all that you get to see. Ulysse Nardin uses a printed sapphire crystal ring for the hour indicator numerals as well as a smaller sapphire crystal sheet for part for the partial seconds indicator near the tourbillon. With all the levels and elements in the dial, it is a beautiful thing to see. The look of the bezel has to do of course with the fact that you need to turn it. For the Diavolo model Ulysse Nardin opted to use a vulcanized rubber insert in the bezel. It looks cool actually. Please note that the piece I am testing here is part of a small limited edition (not for sale) set of 10 pieces in steel. You can’t get these of course, but the ones you can buy are in 18k white gold. 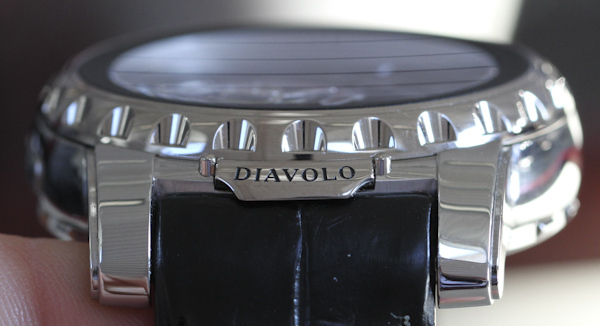 Wearing the Freak and Freak Diavolo is just like any other 44.5mm wide watch. It is a bit tall, but it is really cool. It is also comfortable and looks attractive with the fitted black alligator strap. A watch like this is not only a style statement, but a statement that the person wearing it really cares about watches and mechanics. 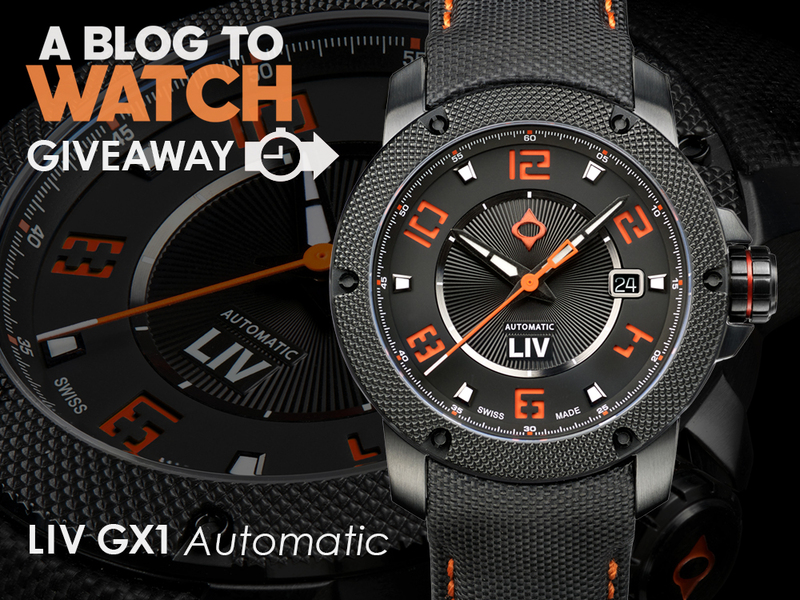 This is like wearing a horologist badge on your wrist – and I’d brandish it proudly. Ulysse Nardin is brand run by refreshingly sober people. We continue to mourn the loss of their charismatic late CEO Rolf Schnyder, but the brand is still running stronger than ever with the same team and new CEO Patrik Hoffman. Watches like the Freak celebrate innovation and technical prowess in an industry which continues to innovate even though it is based on several hundred year old technology The rest of their collection mostly retains a more sober dedication to sports, marine themes, and useful complications. The beautiful Freak Diavolo retails for $153,500. You got to wear the watch I covet most these days. Colour me jealous. I do prefer the palette of the Rolf 75 version a little better, but whatever – amazing piece. The level of finishing they put into that ‘practice’ piece is awesome. Looks great in steel.